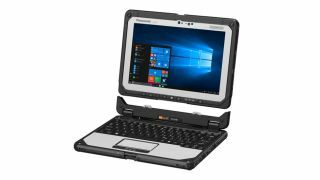 Panasonic has unleashed a refreshed Toughbook 20, which it describes as a ‘fully rugged’ convertible notebook. This 2-in-1 comprises of a detachable 10.1-inch tablet with a resolution of 1,920 x 1,200, powered by an all-new nippier Intel Core i5-7Y57 processor capable of Turbo up to 3.3GHz. You get 8GB system RAM and a 256GB SSD as standard, with options to double those up to 16GB and 512GB respectively. The notebook weighs around 1.77kg in its base configuration, so it’s not too hefty for a rugged model, either. Speaking of its rugged nature, this Toughbook is MIL-STD-810G and IP65 certified, with a magnesium alloy chassis, and the screen is easily viewable in sunlight when working outdoors. As for battery life, the machine can have an optional second battery plugged into the base unit, doubling the normal battery life of 8.5 hours to allow for 17 hours away from a plug socket. The convertible also gives users LTE connectivity for working on the move via eSIM technology and Panasonic’s P.180 connectivity service. The Toughbook 20 further benefits from an infrared webcam (allowing for facial recognition login via Windows Hello), and a rear-facing 8MP camera. Panasonic is also bundling an integrated digitizer for use with the touchscreen, plus there’s an optional magstripe reader. The operating system is Windows 10 Pro, although Panasonic is also producing a model with a lesser Core m5-6Y57 processor that can be downgraded to Windows 7 Pro, for those who wish to stick with the older OS for whatever legacy reasons. Panasonic’s Toughbook 20 is backed by a three-year warranty, and is available now in the US with prices starting at $3,099 (around £2,240).